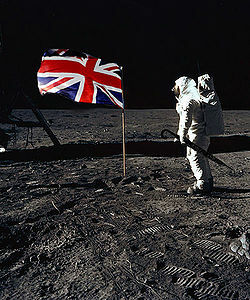 Photograph of the British Moon Landing. Some conspiracists doubt that the image is genuine, pointing out that no Englishman would allow the Union Jack to appear upside down. 2 The making of "Shoot for the Stars"
3 Scene 1 : England-Australia (First Test) Lord's Cricket Ground, London, England. 4 Scene 23 - Robin Hood Starbase, Nottingham, England. 5 Scene 40. England-Australia (Second Test) - Trent Bridge, Nottingham. 6 Scene 43. England- Australia (Third Test). The Oval, London, England. 7 Scene 52. Australia-England (Fourth Test) Edgbaston, Birmingham, England. 10 Scene 59. Deep space. Rather too much for working class types, I fear." With these words Commodore Terrence Lambert-Simnel (RN retired) became the first man to set foot on the moon. 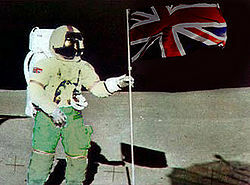 Moments later Group Captain Perkin "Tubby" Warbeck planted the Union Jack in the moon-dust and claimed Earth's only natural satellite for England, for King George and for tax-purposes. Flight Lieutenant Gerald "Stinky" Rawlings stood to attention and saluted through tear-stained eyes from the confines of the command module "Heart of Oak", unable to take part in the actual landing due to a grammar school education. The story of how these two brave men and their batman came to be 400,000 kilometres from the nearest tea-shop is one of the most inspiring and yet little known tales in modern history. The making of "Shoot for the Stars"
In 1948 British Pathe News began an innovative documentary series following Group Captain Perkin Warbeck as he began an exciting voyage into the unknown. These short features were shown around the Empire. 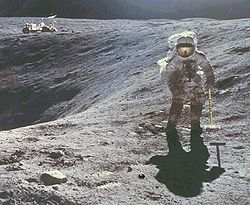 Following the successful moon landing the short features were editted into the Oscar winning feature "Shoot for the Stars", shown at cinemas around the Empire between the "Biggles' Cockpit Capers" serialisation and "The Famous Five and the Lashings and Lashings of Whipped Cream and Jam". The following extracts are reproduced by kind permission of the copyright holder. Scene 1 : England-Australia (First Test) Lord's Cricket Ground, London, England. 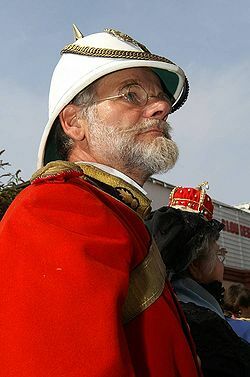 Group Captain Perkin Warbeck inspects the garrison as His Majesty's Governor of the Moon and Interstellar Territories, 1948. Werner Von Schickelgruber, the brilliant but erratic scientist, designer of the first successful rocket died in 1963 following a tragic toothbrush accident. Warbeck - "I say, Duckie, pass the claret." Lambert-Simnel - "Good God, Tubby Warbeck, if I live and breathe. What on Earth are you doing here?" Warbeck - "On Earth for now, Duckie, but for how much longer?" Lambert-Simnel - "You're not... dying, Tubby, are you? Too many good men died in the last show. We'll need you around next time Jerry stirs." Warbeck - "Dying, Duckie? That's the last thing I'd do. I'm going to the moon and I can't imagine a finer fellow to come along for the ride than you. What do you say?" Lambert-Simnel - "Will there be scones, Tubby?" Warbeck - "Scones and an oik to butter them for you, Ducks. How about it?" Lambert-Simnel - "Count me in! 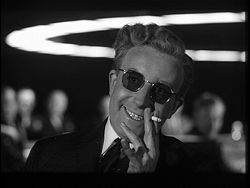 I've been at a loose end since they put a stop to me bombing Dresden!" With those words the moonshot was on and not a moment too soon as England's greatest rivals were working on lunar projects of their own. Rumours abounded that ram-jet testing over Loch Lomond had put Scotland into prime contention, but no one could overlook the Rhondda Rocket programme already under construction in Pontypridd. For now Northern Ireland's progress was slowed by bitter in-fighting but within days the Shankill Road Sputnik would demonstrate to the world that Ulster was not only in the race, but surging ahead. A week later Derry Space centre had launched the "Feinian Flyer" and successfully landed it on Stormont Castle. England's glory was in peril. Scene 23 - Robin Hood Starbase, Nottingham, England. Lambert-Simnel - "I say, what a magnificent erection, Tubby." The launch-pad was all but complete and Tally-ho II stood proudly in the weak light of dawn. Warbeck - "Quite a beauty, isn't she, Duckie. I can hardly wait to ride her." Lambert-Simnel - "One thing occurs to me, Tubs. You were a bit of a dunderhead at school, like me. How ever did you design such a monster." Warbeck - "Not me, Ducks, old thing. Werner Von Schickelgruber." Lambert-Simnel - "Never heard of the bounder." Warbeck - "Prisoner of war, Ducks. German sort, had to tie him down to stop him goose-stepping. Tried to tell me he was an innocent victim of the war, you know. Ha! An innocent Jew, would you believe." Lambert-Simnel - "Everyone knows the Yids were behind Hitler, Tubs. I'm surprised you let him try to fool you like that." Warbeck - "Don't be taken in by this affable exterior, old fruit. Behind these tweeds I'm a perfect devil." Lambert-Simnel - "So what did you do?" Warbeck - "Turned the blighter upside down and pumped crushed ice up his jacksie. That's what I did. I tell you, Ducks, it all came out then." Lambert-Simnel - "When it melted?" Warbeck - "Von Schickelgruber confessed the lot. Did you know the damned Jews were responsible for crucifying Christ? Damnable insolence, murdering the Lord of Hosts, if you ask me. Anyhow, he drew up the designs for this beauty just before we pulled out his toe-nails, the filthy Nazi swine." Lambert-Simnel - "The last laugh will be on the Yids when we claim the moon for Blighty, Tubby." Warbeck - "Well said, Ducks. Then maybe we'll see about crucifying one of their Gods." Scene 40. England-Australia (Second Test) - Trent Bridge, Nottingham. "Heart of Oak" Badge, hand-crocheted by Mrs Ethel Wainwright of Blackburn, Lancashire, official seamstress to Project Tally Ho. Early testing of the Tally-Ho rockets had not been encouraging. The first launch had exploded on ignition, the next after thirty seconds and, though the third had reached orbit in late October 1946, it had become apparent that the failure to install a reverse gear had been a mistake. Even as Tally-Ho III continued to accelerate past Jupiter the listening station at Goonhilly Downs could pick up faint traces of its call-signature "We'll meet again." All was not doom, however. English launch control had been consoled by the lack of progress within rival organisations. The Rhondda Rocket programme had launched in early October, but had exploded within feet of Cardiff Space centre, destroying the Arms Park. The entire nation had mourned around the clock sustained only by Bara Brith and close-harmony singing. The Welsh Aeronautical and Space Administration (WASA) had taken the decision to postpone future launches and concentrate their efforts on the spring shearing. Scottish space exploration had ground to a halt following a series of arguments over the budget, porridge and whether it was reasonable to wear a kilt without underwear in weightless conditions. In Northern Ireland peace had unexpectedly broken out and normal politics had had to be suspended. 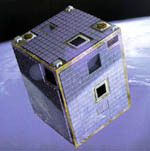 Both Ulster Space missions' budgets were frozen. The "British Aeronautical, Space Travel And Related Developments" agency (B.A.S.T.A.R.D) had formed from the remnants of the four home nation space agencies and had adopted the English design, avoiding input from the Celtic-fringe in case of ginger-contamination. 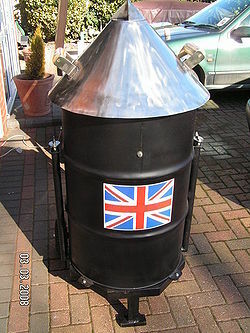 However, in late November the Tally-Ho V rocket designs had been finalised and had included the best aspects of the non-English space programs within the Command Module "Heart of Oak": the Scottish distilling module replaced the Tiffin-maker and a small Irish bar took the place of one of the four conker-storage units. Wales was represented by a small vase of daffodils. Excitement mounted throughout Britain as pre-launch testing was completed in record time. But, unknown to the public, all was not well. Three Tally-Ho V's had been launched into orbit each carrying a Rhesus Monkey. Not one monkey had returned, each one suffering a horrible, lingering death. Lambert-Simnel - "There's nothing for it, Tubs, old man. We'll have to send Rawlings." Warbeck - "But, Duckie, old thing. You can't seriously be suggesting that the first man in space should be.... common." Lambert-Simnel - "I'd say there's no alternative, Tubby. Let's try to keep it out of the papers." Scene 43. England- Australia (Third Test). The Oval, London, England. 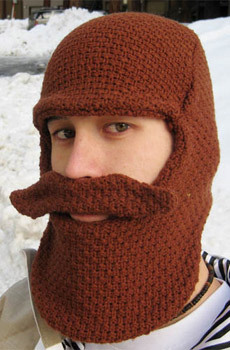 Former Lance corporal Gerald Rawlings testing a full beard-cozy during Arctic training, 1944. Lance Corporal Gerald Rawlings returned to Earth after a four day orbit to a hero's welcome and immediate promotion to Flight Lieutenant. B.A.S.T.A.R.D wasted no time in organising a whistlestop tour of UK. Following a morale-raising visit to Merkin & Sons Wig factory the crew faced reporters at a hastily arranged press-conference. Reporter from The Times - "Commodore Lambert-Simnel, why can't the Flight Lieutenant speak to us?" Reporter from the Daily Telegraph - "Will he recover?" Lambert-Simnel - "Partially. But we fear he may be cruelly disabled." Times - "In what way?" Lambert-Simnel - "He may be forced to speak in a Geordie accent for the rest of his life." Shocked voices register the news, ashen faces look up to the stage, already composing tomorrow's headlines. Warbeck - "But rest assured he did attend Eton!" Lambert-Simnel - "Under an assumed name." Warbeck - "And with a different face." Scene 52. Australia-England (Fourth Test) Edgbaston, Birmingham, England. Lambert-Simnel - "I say we waste no more times, Tubbs. If we lolligag around here someone else may get to the moon first and we don't want the French smearing their nasty garlic footprints over our green cheese, what?" Warbeck - "Quite right, let's go tomorrow. Nanny will make sandwiches and we'll send Rawlings out for Ginger Beer." Replica of the original British space station "The Princess Margaret" in which Flight Lieutenant Gerry Rawlings first orbited Earth. Lambert-Simnel - "Nice idea, Tubbs. But not tomorrow. It may look a bit odd, three chaps choosing to spend Valentine's Day crammed together in a space that small." Warbeck - "Don't see why, Duckie. I had to share a bed with two other boys at prep school and there wasn't much space in there, I can tell you." Lambert-Simnel - "Were they very short of space at your prep school, Tubby, old fruit?" Warbeck - "Now you mention it, no. There was a whole empty dorm next door." The door to the pavilion burst open. Newly promoted Flight Lieutenant Gerry Rawlings grasps the railing of the pavillion, struggling for breath and pawing the air. The Commodore slaps him smartly across the face. Lambert-Simnel - "Members only, cloth ears! I told you that this morning." Rawlings - "It's Belgium, sir!" Commodore Simnel slaps Rawlings across the face again. Lambert-Simnel - "It is not Belgium, Rawlings. It's Birmingham. Now get back to polishing my boots, damn you. I want to be able to see my face in them." Rawlings - "But, sir, they're suede!" Lambert-Simnel - "None of your excuses, you lazy hound. Now get out before I have you keel-hauled. Jack Hobbs is about to make a century." But it was true. Belgium had launched it's own moon-shot that morning and the papers were full of it. Later that evening Lambert-Simnel and Warbeck revised their plans. Lambert-Simnel - "The Times says England-0, Dago Belgians-1, Tubbs." Warbeck - "Bally cheek. What are they powering their rocket with?" Lambert-Simnel - "Chocolate and ennui, it says." Warbeck - "Hmmm, foreign muck! Well, we'll have no trouble passing them. We take off at dawn!" The tiny command module "Heart of Oak" perched precariously above the enormous Tally-Ho VI rocket. Its crew occupied themselves nervously, trying not to think about the fate of the Rhesus monkeys: Rawlings made tea while Warbeck composed a letter to the Times to express his dismay at seeing Darkies in the Commonwealth Exhibition Hall's Africa section. Commodore Lambert-Simnel put down Wisden and offered some last minute advice. Lambert-Simnel - "Milk in first this time, Rawlings, rot you. Did your mother teach you nothing?" A constant stream of instructions from the ground intercom helped diffuse the tension. 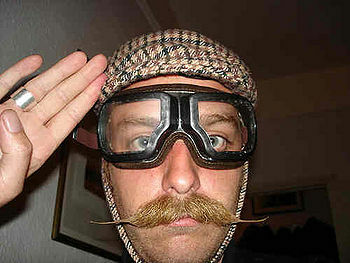 Commodore Lambert Simnel's moustache looked resplendent in weightless conditions. Intercom - "Roger wilko, Heart of Gold. Pre-ignition check routine commencing. Lift off in approximately two minutes." Warbeck - "Hear that, Ducks!" Warbeck - "Fuel pump active?" Warbeck - "Back-up batteries charged?" Warbeck - "Prepare for main ignition. Engage main engine." Warbeck - "Engage secondary thrusters." Intercom - "Five. Four. Three. Two. One. God save the King!" With an deafening roar Heart of Oak was lifted above the launch-pad by the mighty Tally-Ho VI rocket, its three man crew pressed back into their seats." Warbeck - "Look here, Duckie, pass the kedgeree. Rawlings is trying to starve me, the heathen." Lambert-Simnel -"I say Tubby, the world looks jolly rum from this height." Warbeck - "Smaller than I'd imagined, Duckie. And mostly Navy blue, I noticed." Lambert-Simnel -"That'll be the sea, Tubbs." Warbeck - "Yes, I expect so, but the land's all wrong too. Most of it's red on the maps I'm used to, except the damned French bits. And where's England?" Rawlings - "Isn't that it there, sir? Between Ireland and Norway?" Warbeck - "Don't be a duffer, Rawlings, that's far too small. Look, here she comes now, see?" Rawlings - "That large island, sir? 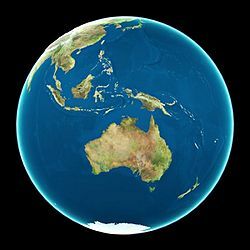 The one the shape of Australia?" Warbeck - "Yes, that'll be the chap. I say, Duckie, I might have thought of this before if I wasn't such a dunce but how are we to land when we get back from the moon?" Lambert-Simnel -"We're going to 'Splash Down' in Derbyshire, Tubbs. It's a new idea, I had." Warbeck - "And a dashed good one I expect. But isn't Derbyshire land-locked?" The popularity of space croquet soared throughout the Empire following the Heart of Oak's landings. Lambert-Simnel -"Yes, but we'll land in the ornamental carp pond at Chatsworth. My niece just married the Duke of Devonshire's boy, they're sure to have something edible knocking about and I expect we'll be famished by then." As the comforts of Earth drifted slowly further away, the three-man crew unclipped their safety harness and made their way from the the Command module to the less cramped research module. Lambert-Simnel and Warbeck immediately began looking into revisions needed to the rule-book if Space-croquet was to be adopted as a sport for the next Empire Games. Rawlings busied himself proving beyond doubt that is was possible to toast crumpets in weightless conditions. Warbeck - "I say, Ducks. Do you suppose we'll meet moon-men?" Lambert-Simnel -"I shouldn't be surprised, Tubbs." Warbeck - "I wonder if they'll be friendly? What will we do when they see us?" Lambert-Simnel - "We'll do what Englishmen have done through the generations: plant the flag in their soil, tell 'em it's ours now and start charging 'em rent on it." Warbeck - "Capital, Duckie. I say, I wonder if they'll be little green men. I wouldn't be surprised if Rawlings is scared of them." Rawlings - "I don't think so, sir. Aliens don't bother me, there was a Hindoo in my unit at Anzio." The Belgian moon-module was designed in tribute to French cubist, Georges Braque, who is thought to have seen Belgium from a distance. As the men drift moonwards a strange object becomes visible. It is clear that the Heart of Oak will catch it soon. Warbeck - "Good heavens! What do you suppose it is?" Lambert-Simnel - "Couldn't say for sure, Ducks. But I shouldn't be surprised if it's the dashed Belgians." Warbeck - "I expect you're right. But why on Earth are they flying a brick?" Lambert-Simnel - "All Europeans lack imagination, Duckie, you should know that. And your average Belgian's worst than most - little more than a sausage-chomping Dutchman in a stripey jumper, cycling round the place with onions round his neck and one of those pinko berets on his nut." Warbeck - "You paint a ghastly picture, Tubbs. Why do they do it, do you suppose?" Lambert-Simnel - "Who can say, Ducks. I spent some time in Flanders myself, back in '16. It was a strange place. Do you know, when a Belgian dies they dress the corpse in khaki and leave it in a field to rot. There were thousands of them, the place stinks like a charnel house. And you should see how they live; half-constructed houses, hardly any of them with a roof. Not even the churches! " Warbeck - "The animals! I'm glad we live on a different continent, Tubs. There's half an ocean between England and that sort of nonsense, and half an ocean is half an ocean too little in my opinion." Though the brave crew of Heart of Oak couldn't have known it, there was already trouble on the Belgian moon mission which was drifting aimlessly through the ether. It soon became apparent that the guidance boosters were both firing, but in opposite directions. Inside civil war had broken out between the Walloons and Flemmings. The four man crew had split evenly along ethnic grounds, with each controlling one thruster. The trouble had started the previous evening, Comander Jaques Brel had only begun to declaim his eight page treatise on the meaninglessness of existence when Major Vincent Van Hire asked his Flemish compatriot Grut Van der Merde to pass the beer. The explosion of phlegmish had clouded the visor of Brel's helmet, rendering further reading impossible. The conflict had been unceasing since. Lambert-Simnel - "We're about to pass them, Tubbs." Lambert-Simnel - "Oughtn't we to stop and offer them a lift though?" Warbeck - "Best not, Duckie, old sausage. We helped them out in the first war and the last. They weren't a bit grateful." Lambert-Simnel - "I wouldn't say that, Tubbs. I distinctly remember being kissed by several girls when we liberated Antwerp." Warbeck - "I don't want to be kissed by girls with facial hair, Duckie, I have my club for that sort of thing." 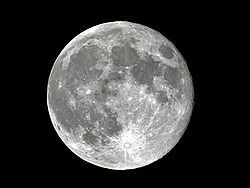 Photograph of the moon taken by Sir Patrick Moore on the day of the moon landing. The Heart of Oak can be seen as a small dark speck just above the Crater of Ill-Thought-Out-Names. Lambert-Simnel - "There she is, Tubby. The moon at last." Warbeck - "Excellent. Take her in for a closer peek, Rawlings." Through the viewing window the surface of the moon becomes clearer in the eerie, unearthly light. Warbeck - "Bleak, isn't. Almost frightening, really." Lambert-Simnel - "Chin up, Tubs. We've been in worse spots than this." Rawlings - "Yes, sir. Remember when you appointed me your batman? We were in Aldershot then, sir." Warbeck - "Quite right, Rawlings. Take us into a lower orbit. I want to get a good look at the landing site before we prepare for touch down." Rawlings - "Certainly, sir. There it is - 'The Sea of Tranquility', sir." Lambert-Simnel - "Dash it all, Rawlings. Are you sure that's the Sea of Tranquility. I'd hoped to do a spot of paddling!" The tiny landing craft detached from the main body of 'Heart of Oak' and gently drifted a few feet away. A brief burst of the guidance thrusters sent it slowly towards the surface. Lambert-Simnel - "What do you suppose caused all these dashed craters, Tubs?" Warbeck - "Nanny always said it was cows trying to jump over the moon and missing." Lambert-Simnel - "Wouldn't have thought so Tubs. We have cows, they're not much interested in athletics." Warbeck - "I don't know, Duckie. She was a clever old stick, Nanny. Always remembered to move her night-things out of Father's room before Mother came home from Suffragette camps." Commodore Lambert-Simnel posing in his Space Khakis, whilst famously leading Ground Control in a rendition of "Jerusalem". Warbeck - "Yes, she was a very accommodating sort." The surface loomed up in the screen again. Lambert-Simnel - "100 feet, 80, 50 20- Brace for impact." Warbeck - "Good luck, Duckie." 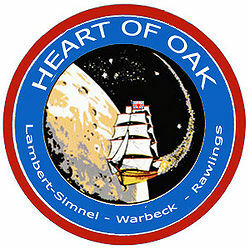 The landing module of 'Heart of Oak' collided with the moon's surface with a jolt. Clouds of dust filled the viewing screen. Its two inhabitants breathed heavily and unfastened their safety harness. Lambert-Simnel - "Well, this is it, Tubs. I'm going to open the door." Warbeck - "Yes. Did you bring the cricket ball, Duckie? I rather fancy being the first man to bowl a chinaman on the moon." Lambert-Simnel - "Capital idea. Now, who goes first?" Warbeck - "After you, Ducks, you're the ranking officer." Lambert-Simnel - "That's decent of you, Tubs. Do you suppose Heaven will look like this?" Warbeck - "I don't know but don't forget the flag. If this is Heaven at least we know God will be pleased to see us. He is an Englishman, after all." England Tally-ho Football hooliganism Designed by Von Schickelgruber, built by British craftsmen. Wales Roced y Rhondda Dragons Progress hampered by the construction team repeatedly bursting into song. Scotland McMissile Whiskey Pilot Rab C. Nesbitt missed the moon and flew up Uranus. Northern Ireland 1 Shankill Road Sputnik Sectarianism and Protestant work ethic Ulster said No. Northern Ireland 2 Falls Road Flyer Sectarianism and Leprechauns Abandoned due to the possibility of sharing the moon with Protestant aliens.